Have you ever had a moment at work that felt like it was being spoken, written, or sketched by another? It may last for only a second, but when it happens you have this sense that circumstances are playing out on purpose, that they are heading somewhere, and that there is a plot. Even though you know you are the one making choices, it is as though you are living into a script that, in some mysterious way, has already been written. The beauty, clarity, creativity, or goodness of what you are doing seems a bit too good, too wonderful, too outside-of-yourself to be solely sourced in you. It is like you are part of a story that God is, in real time, authoring and speaking. There is a spokenness to all of life, of course, but one important place where it happens is at work. This can happen to me when I’m preaching—having a sense that my words aren’t mine, even though I’m speaking them. They are more eloquent than I’m capable of and carry a poignancy, power, and efficacy that are beyond me. When these moments happen, it feels like everyone in the congregation also knows that something bigger is going on, that someone else is speaking. You would expect (or at least hope for) that to happen in a church, through the work of a preacher, but if God truly is speaking the embodied parable that is you-doing-your-job, then shouldn’t you have these kinds of moments as well? After all, your work is every bit as much a ministry! 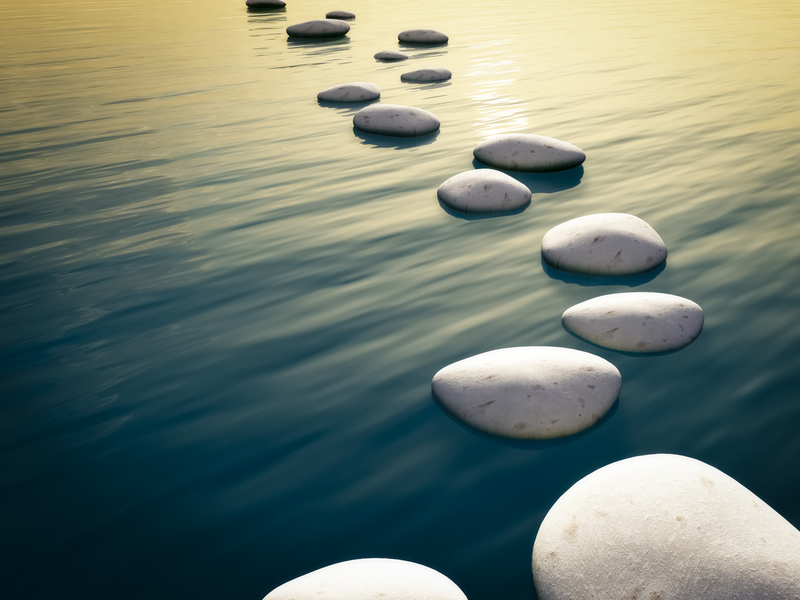 Following are a few ways to more fully identify and enter into the spokenness of your job. One of the best ways to learn how to identify the spokenness of your job is by listening to what God might be saying through another person’s work—ideally, someone whose work has had a direct and beneficial impact on you: a nurse who helped you in the waiting room, a retailer who helped you find what you were looking for, a mentor who gave you some wise new perspective. 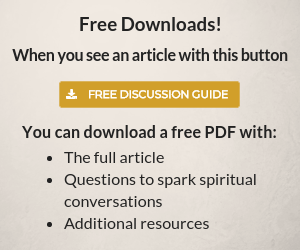 There are several reasons why this is a good starting point. First, it is easier to discern God’s voice through someone else’s job (it is hard to stand objective to yourself). By honing your ability to read God’s word in another person’s work, you grow your capacity to read his word in your own. Second, by applying this discernment process to work that directly benefits you, you increase the odds of encountering God’s activity there. By definition God is always working for your best interest. Third, when someone’s work benefits you, you become more yourself. When you are more yourself, you are more of who God made you to be, and you have more of yourself with which to discern God’s work in your life. And fourth, there is something very important about the stance of receiving that aids in discerning the spokenness of life. All of life is a gift from God. Everything is received. To be in a receptive stance—needing, open, vulnerable, and trusting—is to acknowledge the basic state of your reality. There is something about the humility of that place that is crucial to discerning the spokenness of one’s life and work. For years I have sat in the same hairstylist’s chair; trying to discern what God was saying through her job. Talk about a trusting and vulnerable place! Every month or so, I put a part of my identity into her hands. And as the grateful recipient of the good graces of her hairstyling expertise, I was aesthetically made new and became a little bit more myself again. Receiving the goodness of her work, I came to understand a little bit more of God’s identity-renewing nature. Think about it. A stylist holds your head as you lean back into a washing basin. With her own hands she washes your hair and, if you are lucky, gives you a scalp massage. After she towel dries you, and moves you to the chair, she then takes a part of who you physically are—your hair—and cuts it, reshapes it and, for some, recolors it! A stylist touches your body and uses sharp instruments near your eyes, and you sit there, wide open to this very intimate aesthetic intervention. In order to see God’s hand at work in the parable of another person’s job, you have to let the good work that they do touch you. 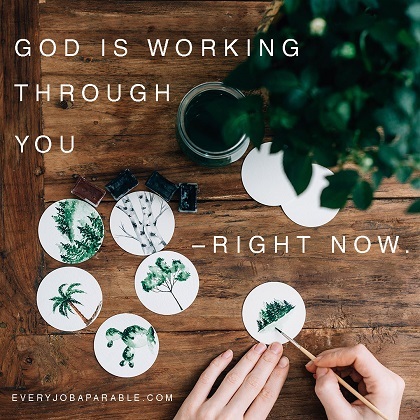 God knows every intimate detail of who you are—your flaws, the grey areas, where you are thinning—and wants to make every square inch of your body and being new. He wants to shape you, to wash, cut and dry, and style your life. When you receive the good work of another human being at an intimate level, you become a more trusting and open person. Openness is key to seeing God at work. When you put yourself in the hands of another, you become more of the kind of person who is comfortable in the hands of Another. This is the optimal position to be in to see God’s hands holding you. Every visit to the salon is an opportunity to grow in your capacity to be aware of and receive God’s intimate touch wherever you work. Discussing what she loved most about her work, my stylist said, “Hearing the words, ‘I trust you.’” Customers often step into her salon totally exasperated and give her total freedom to cut and style their hair in whatever way she thinks best. Knowing hair the way she does, assessing a person’s face shape, and considering their overall look, she will come up with something her customer could never have imagined, often to their great delight! But it takes trust to get there. You need to let go and put your life in another’s hands. It is only then that you will be able to experience the delight—both yours and that of the one who is making you over. Even as a stylist delights in being given this kind of trust, God does too. 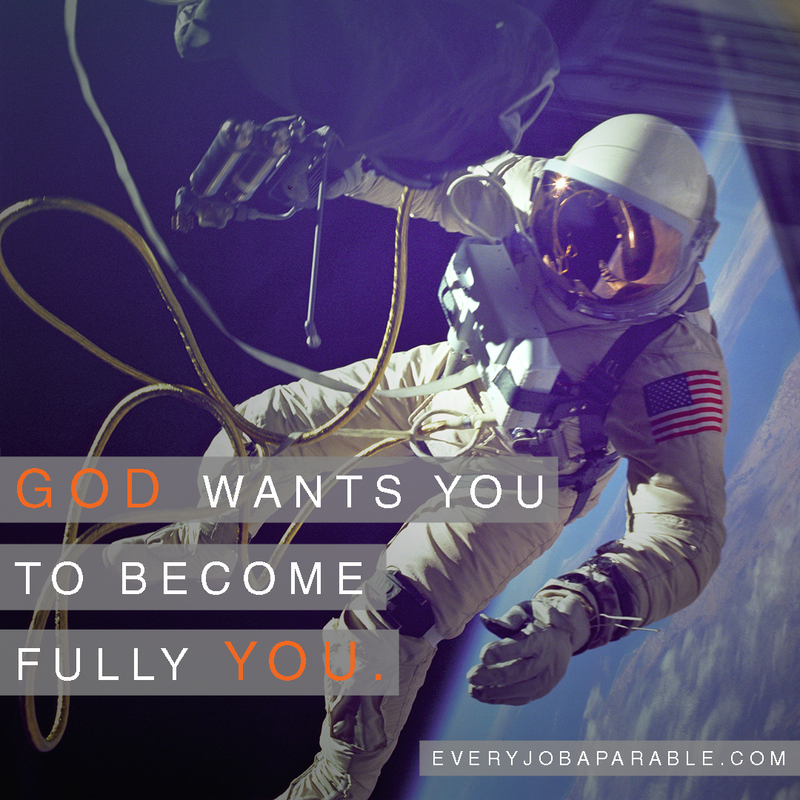 God wants you to become fully you. He desires the best for your life and has a maker’s heart to know what it will take to get you there. Saying “I trust you” can take many forms in a vocational context. When you extend trust, you make “room” for God to prove himself trustworthy; in a sense you free space for God to intervene in a powerful new way. Even as a stylist relishes a time when she has complete freedom to make someone new—her sense of responsibility growing, her creative adrenaline starting to pump, her desire to do her best now piqued—God must surely rise to the occasion as well. This is what happens when you submit your will to his. In that new place of increased will alignment you discover that he is closer to you than you realize. You’ve been reading Every Job a Parable by John Van Sloten. John is a pastor in Calgary and is at the forefront of the conversation on faith and vocation. His first book was The Day Metallica Came to Church. Watch his sermons or start reading Every Job a Parable now! I enjoyed reading the excerpt from Every Job a Parable. I’m retired from a career in special education, and believe the Lord showed me how we all suffer from spiritual learning disabilities, and how the Holy Spirit is our Beloved Special Ed Teacher. Through His intervention we begin to understand our lives. Thanks for the great parable!